Regardless, I just can’t get behind any glass-based item that purports to be able to withstand temperatures of more than three hundred degrees. Good lord, I used to worry about whether or not my teeth would explode if I drank something hot and then something cold immediately after, so the idea of heating up something as brittle as glass, in an oven… well, it just ain’t right. My apprehension towards glass cookware doesn’t preclude me from owning a set, however, and on occasions, it does get used. Such occasions include when I don’t feel like going out to the store to get a cheap metal pan, or when I want to “class up” the food I’m preparing. “Classing up” the food happens sometimes. Let it be known now that, though I will swear up and down that I can’t cook toast, most of this argument stems from the fact that I don’t want to cook toast, rather than that I am incapable of doing so. In fact, I consider myself a fair-to-middlin’ shot as far as cooking goes, and have had some successes performing questionable culinary experiments with a slow cooker (ask me about my Franco-Russian chicken). I am also, though I profess no actual Italian heritage, pretty decent at preparing Italian food. Italian food is what I was preparing when the “incident” occurred. I had embarked on a fairly epic lasagna adventure, and was trying to “class up” my meal — for presentation to others — by preparing it in some classy-style Pyrex cookware. This lasagna adventure was turning out very well. I am not a fan of meat in lasagna so much of what I was doing involved cheese alchemy. I had just figured out a new ratio of herbs and spices and so on to froth into the Ricotta and had done so. I then strategically laid out noodles, cheeses, and sauces into my cookware, which was then placed gingerly into my preheated oven. Cookie tray added later, for maximum drip-catch. While using one of your fine glassware baking dishes, which I believe was a member of the “5 piece bake set”, I encountered a setback. Having used these dishes several times for things like baking chicken or macaroni and cheese or various species of casseroles, imagine my surprise when, whilst using it to prepare quite possibly the best lasagna I have ever concocted — and I mean that: I had figured out a new way to blend the ricotta, and had added just the right amount of spices (which I am now out of). This is neither here nor there, as the pan literally exploded with the force of a twelve-gauge shotgun somewhere around eight seconds after I placed it into the preheated oven. I have photographs to confirm this, if anybody would like to see it, and I’m mostly lucky that the oven door was closed lest I be riddled with Pyrex-brand shrapnel. I do not want a refund, nor do I want a replacement set of dishes. Frankly, those foil roasters you can get at the supermarket for $3 are a vastly superior product that does not, you know, explode. However, should you ever decide to enter into a government contract for the production of weaponry, I believe this would give you a clear advantage over other organizations such as Raytheon or General Dynamics. Obviously too shaken up to even use proper grammar and punctuation, I clicked “Send” and blasted it off via their website’s feedback form. While my lack of good grammar bothered me a little bit, I didn’t figure anybody would read the thing, so it didn’t make any difference. 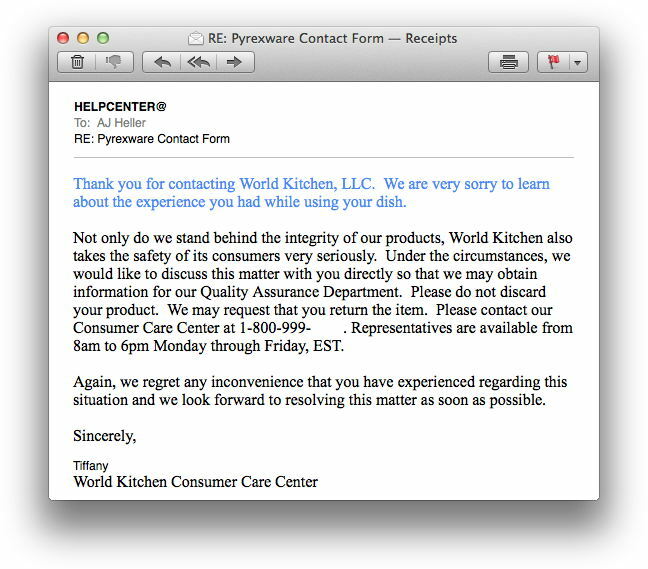 I mean, seriously, who reads complaints made to Pyrex customer support? I felt mildly vindicated, in that my grievance had not fallen on deaf ears, and figured I’d leave it at that. I happened to have some free time a few days later, though, and my brain kept wandering to the email I’d received. In any case, I had to defend the inferior quality of my complaint letter, so I dialed the number they gave me and was greeted with the sound of an automated system, which I navigated with much the same deftness and speed as an octopus navigating the Arctic tundra. I was then informed that the wait before my call would be answered was somewhere around seventeen minutes, but that I was very important to them and, if I’d just hang on the line, they’d be with me as soon as possible. So I waited, and time ticked away. I practiced what I would say for maximum oomph while I waited, and also had a momentary panic attack when I was suddenly, irrationally, unsure if the glassware that I had owned was Corning rather than Pyrex (irrational because they’re actually the same company). Pushing these doubts aside, though, I plowed on for the finish line. After almost exactly seventeen minutes had passed, a man named Pachmed finally answered the phone. He sounded far away, and asked what my issue was. I relayed the entire story to him. I told him how I’d managed to alchemize an incredible new mixture ratio of herbs and spices to cheeses, and how that had translated to bringing to life the greatest lasagna monster of all time. I explained to him how I was using my glassware to class up my presentation, and how, while the best damn lasagna ever cooked in my oven, the glassware it was in exploded. I told Pachmed about the email I had received from Tiffany in response to my complaint, about how it said I was supposed to save the pieces of the dish so that they could be returned and Pyrex could perform what I can only imagine would be military-grade ballistics tests. Finally, I explained how the email had told me to call them to discuss the situation. “But you don’t want a replacement?” he asked again. “Well, good day then, Sir,” Pachmed finished, and hung the phone up. I was left hanging in space, holding a dead phone to my ear in confused indignation. That was it? Nearly $50 in lasagna ingredients, the estimated $7.60 cost of my exploding dish ($37.99 for the whole set, divided by 5, in case you’re wondering where that came from), and now nearly thirty minutes of my time spent arguing with automated phone systems and waiting on hold — not to count the debilitating emotional trauma of the entire situation — and the end result was to be dismissed and hung up on by a man who apparently had a cannoli? Exploding cookware ain’t no joke. If I had been inside the oven when it had exploded, I could have lost an eye… or worse! This meme would’ve been really funny if it was still 2012. 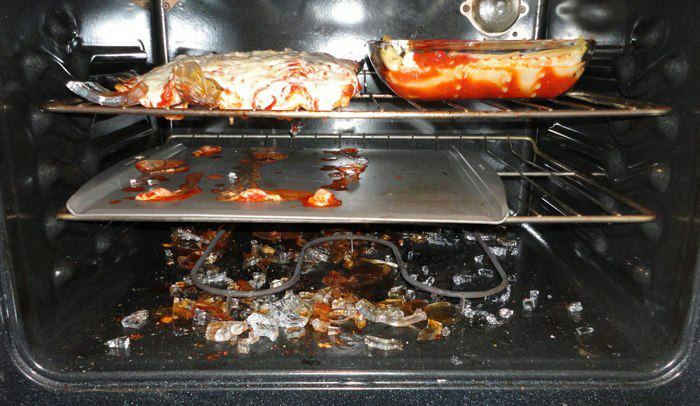 I didn’t seem to be the only one who’d had issues with their Pyrex exploding randomly, as evidenced here, here, and… oh, just do a Google search and you’ll find lots of stuff. The bottom line is that it all seems to have happened at just around the same time as my own misadventure: my Facebook newsfeed was littered with reports similar to mine. The American Ceramic Society — which is apparently an actual thing — seems to have solved the mystery, though, and it has to do with the kind of glass that is used to make the dishes. The long explanation, if you’re masochistic enough to read it, is here, but the short explanation is that World Kitchen, who owns Pyrex and Corning and whatever else, had been phasing out the use of borosilicate glass in favor of the much cheaper soda lime silicate glass, which is actually just regular old, run-of-the-mill glass, and is nowhere near as heat resistant as borosilicate. In Europe, where borosilicate glass is still used almost exclusively for this sort of thing, there were no reports of exploding glassware at all. It’s only here, in cheap-o America, that we’ve got the grenading glassware. So, is Pyrex determined to fix things and go back to what works, now that a bunch of people have had dishes explode (and, in at least one case, require stitches)? Well, of course not! No, we’re just going to get a warning label, a small aside telling us not to do the sorts of things with these dishes that they are advertised for. Those American Ceramic Society guys have said that “no calculations suggest the soda lime silicate glass would be likely to survive a rapid exposure to boiling water,” and yet this is something that I’m supposed to be putting in a 450° oven?! Well, I guess not, because they also state that Pyrex “does not appear to be adequate for all household cooking”. We love to do this sort of corner-cutting that creates an inferior but cheaper to manufacture product, while simultaneously proclaiming the greatness of said product. Take a look at the Pyrex web site. No, really, I’ll wait. What are they selling? Glass products that are marketed as things like “baking dish” and yet, when you read the “use and care” section, they essentially tell you not to use it as a baking dish because it might explode in your face. It’s not just glassware companies that are substituting out quality for cheapness, either. American consumption of high fructose corn syrup rose about 1,000% between 1970 and 1990, and practically everything we eat or drink is now doused in the stuff. Why? Because, much as how soda lime silicate glass is cheaper than borosilicate glass, high fructose corn syrup is cheaper than sugar, that’s why. It’s also sweeter than sweet, so giant megalithic food companies use it instead, charge the same amount as they would otherwise, and reap enormous profits. These food companies, and the FDA, will rail on and on about how high fructose corn syrup is totally safe and has no adverse health effects, but it doesn’t take a high fructose brain surgeon to realize that, when everything you jam in your face is glazed with the stuff, you’re going to see adverse effects. Didja know that about 35% of the American population is considered obese? Comparatively, in Europe — where things like HFCS are not quite as prevalent — the obese population lumbers in at around 23%. On retrospect, maybe the best damn lasagna I’d ever concocted wasn’t the best at all: while the pasta was whole grain and the cheeses were free of tampering, the diced tomatoes and tomato paste that I used to make the sauce were loaded with high fructose corn syrup. Maybe, just this once, violently exploding cookware actually did me a little bit of good: I ended up eating Cheerios for dinner that night, and at least Cheerios are good for you, right…? Whatever, Man. I don’t care. Shut up. I still don’t like Pyrex. This entry was posted in Humor, Ranting, Science and tagged acs, american ceramic society, borosilicate, cannoli, cheerios, cookware, corning, cost cutting, exploding, exploding teeth, fda, franco-russian chicken, glass, glassware, gmo, hfcs, high fructose corn syrup, lasagna, pyrex, skyrim meme, soda lime silicate, sugar, taylor swift, world kitchen. Bookmark the permalink. I’m always up for a good lasagne adventure, and you delivered. Thank you. Some of my greatest adventures are pasta-based. Glad you liked it! I loved this! Very entertaining take on what is always a frustrating process whenever I have to contact any MegaCorp Customer Service department in Godda Mned, Nowhere. 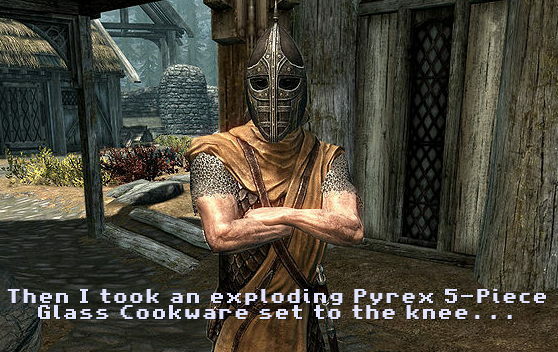 I’m still smiling over weaponized Pyrex shrapnel. Typical that they would expect you to have kept all the shards of imitation glass untouched in the oven, covered in cheese and a brilliantly conceived sauce, for weeks until they reached you. Though the self-cleaning thing on my oven managed to vaporize most of my would-be beautiful meal, it did not vaporize the glass shards, which are still strewn about the bottom of the oven. I keep holding out hope that official-looking people in suits from Pyrex and/or the defense department are going to show up at the door to collect it. Maybe I should sweep it all into a bag for them, so it’ll be easier for them to collect.